Anesthesia or anaesthesia (from Greek "without sensation") is a state of controlled, temporary loss of sensation or awareness that is induced for medical purposes. It may include analgesia (relief from or prevention of pain), paralysis (muscle relaxation), amnesia (loss of memory), or unconsciousness. A patient under the effects of anesthetic drugs is referred to as being anesthetized. Regional and local anesthesia, which block transmission of nerve impulses from a specific part of the body. Depending on the situation, this may be used either on its own (in which case the patient remains conscious), or in combination with general anesthesia or sedation. Drugs can be targeted at peripheral nerves to anesthetize an isolated part of the body only, such as numbing a tooth for dental work or using a nerve block to inhibit sensation in an entire limb. Alternatively, epidural or spinal anesthesia can be performed in the region of the central nervous system itself, suppressing all incoming sensation from nerves outside the area of the block. Risks during and following anesthesia are difficult to quantify, since many may be related to a variety of factors related to anesthesia itself, the nature of the procedure being performed and the patient's medical health. Examples of major risks include death, heart attack and pulmonary embolism whereas minor risks can include postoperative nausea and vomiting and hospital readmission. Of these factors, the person's health prior to the procedure(stratified by the ASA physical status classification system) has the greatest bearing on the probability of a complication occurring. Patients typically wake within minutes of anesthesia being terminated and regain their senses within hours. Different types of anesthesia affect the endpoints differently. Regional anesthesia, for instance, affects analgesia; benzodiazepine-type sedatives (used for sedation, or "twilight anesthesia") favor amnesia; and general anesthetics can affect all of the endpoints. The goal of anesthesia is to achieve the endpoints required for the given surgical procedure with the least risk to the patient. Safe anesthesia care depends greatly on well-functioning teams of highly trained healthcare workers. The medical specialty centred around anesthesia is called anesthesiology, and medical doctors who practise it are termed anesthesiologists. Ancillary healthcare workers involved in anesthesia provision have varying titles and roles depending on the jurisdiction, and include nurse anesthetists, anesthetic nurses, anesthesiologist assistants, anaesthetic technicians, physicians' assistants (anaesthesia), operating department practitioners and anesthesia technologists. International standards for the safe practice of anesthesia, jointly endorsed by the World Health Organization and the World Federation of Societies of Anaesthesiologists, highly recommend that anesthesia should be provided, overseen or led by anesthesiologists, with the exception of minimal sedation or superficial procedures performed under local anesthesia. 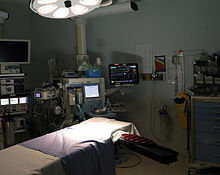 A trained, vigilant anesthesia provider should continually care for the patient; where the provider is not an anesthesiologist, they should be locally directed and supervised by an anesthesiologist, and in countries or settings where this is not feasible, care should be led by the most qualified local individual within a regional or national anesthesiologist-led framework. The same minimum standards for patient safety apply regardless of the provider, including continuous clinical and biometric monitoring of tissue oxygenation, perfusion and blood pressure; confirmation of correct placement of airway management devices by auscultation and carbon dioxide detection; use of the WHO Surgical Safety Checklist; and safe onward transfer of the patient's care following the procedure. One part of the risk assessment is based on the patients' health. The American Society of Anesthesiologists has developed a six-tier scale that stratifies the patient's pre-operative physical state. It is called the ASA physical status. The scale assesses risk as the patient's general health relates to an anesthetic. Anesthesia is a combination of the endpoints (discussed above) that are reached by drugs acting on different but overlapping sites in the central nervous system. General anesthesia (as opposed to sedation or regional anesthesia) has three main goals: lack of movement (paralysis), unconsciousness, and blunting of the stress response. In the early days of anesthesia, anesthetics could reliably achieve the first two, allowing surgeons to perform necessary procedures, but many patients died because the extremes of blood pressure and pulse caused by the surgical insult were ultimately harmful. Eventually, the need for blunting of the surgical stress response was identified by Harvey Cushing, who injected local anesthetic prior to hernia repairs. :30 This led to the development of other drugs that could blunt the response leading to lower surgical mortality rates. The most common approach to reach the endpoints of general anesthesia is through the use of inhaled general anesthetics. Each anesthetic has its own potency which is correlated to its solubility in oil. This relationship exists because the drugs bind directly to cavities in proteins of the central nervous system, although several theories of general anesthetic action have been described. Inhalational anesthetics are thought to exact their effects on different parts of the central nervous system. For instance, the immobilizing effect of inhaled anesthetics results from an effect on the spinal cord whereas sedation, hypnosis and amnesia involve sites in the brain. :515 The potency of an inhalational anesthetic is quantified by its minimum alveolar concentration or MAC. The MAC is the percentage dose of anesthetic that will prevent a response to painful stimulus in 50% of subjects. The higher the MAC, generally, the less potent the anesthetic. The core instrument in an inhalational anesthetic delivery system is an anesthetic machine. It has vaporizers, ventilators, an anesthetic breathing circuit, waste gas scavenging system and pressure gauges. The purpose of the anesthetic machine is to provide anesthetic gas at a constant pressure, oxygen for breathing and to remove carbon dioxide or other waste anesthetic gases. Since inhalational anesthetics are flammable, various checklists have been developed to confirm that the machine is ready for use, that the safety features are active and the electrical hazards are removed. Intravenous anesthetic is delivered either by bolus doses or an infusion pump. There are also many smaller instruments used in airway management and monitoring the patient. The common thread to modern machinery in this field is the use of fail-safe systems that decrease the odds of catastrophic misuse of the machine. An anesthetic machine with integrated systems for monitoring of several vital parameters. Patients under general anesthesia must undergo continuous physiological monitoring to ensure safety. In the US, the American Society of Anesthesiologists (ASA) has established minimum monitoring guidelines for patients receiving general anesthesia, regional anesthesia, or sedation. These include electrocardiography (ECG), heart rate, blood pressure, inspired and expired gases, oxygen saturation of the blood (pulse oximetry), and temperature. In the UK the Association of Anaesthetists (AAGBI) have set minimum monitoring guidelines for general and regional anesthesia. For minor surgery, this generally includes monitoring of heart rate, oxygen saturation, blood pressure, and inspired and expired concentrations for oxygen, carbon dioxide, and inhalational anesthetic agents. For more invasive surgery, monitoring may also include temperature, urine output, blood pressure, central venous pressure, pulmonary artery pressure and pulmonary artery occlusion pressure, cardiac output, cerebral activity, and neuromuscular function. In addition, the operating room environment must be monitored for ambient temperature and humidity, as well as for accumulation of exhaled inhalational anesthetic agents, which might be deleterious to the health of operating room personnel. Sedation (also referred to as dissociative anesthesia or twilight anesthesia) creates hypnotic, sedative, anxiolytic, amnesic, anticonvulsant, and centrally produced muscle-relaxing properties. From the perspective of the person giving the sedation, the patient appears sleepy, relaxed and forgetful, allowing unpleasant procedures to be more easily completed. Sedatives such as benzodiazepines are usually given with pain relievers (such as narcotics, or local anesthetics or both) because they do not, by themselves, provide significant pain relief. Central nerve block: Local anesthetic is injected or infused in or around a portion of the central nervous system (discussed in more detail below in Spinal, epidural and caudal anesthesia). Risks and complications as they relate to anesthesia are classified as either morbidity (a disease or disorder that results from anesthesia) or mortality (death that results from anesthesia). Quantifying how anesthesia contributes to morbidity and mortality can be difficult because a person's health prior to surgery and the complexity of the surgical procedure can also contribute to the risks. Morbidity can be major (myocardial infarction, pneumonia, pulmonary embolism, renal failure/insufficiency, postoperative cognitive dysfunction and allergy) or minor (minor nausea, vomiting, readmission). There is usually overlap in the contributing factors that lead to morbidity and mortality between the health of the patient, the type of surgery being performed and the anesthetic. To understand the relative risk of each contributing factor, consider that the rate of deaths totally attributed to the patient's health is 1:870. Compare that to the rate of deaths totally attributed to surgical factors (1:2860) or anesthesia alone (1:185,056) illustrating that the single greatest factor in anesthetic mortality is the health of the patient. These statistics can also be compared to the first such study on mortality in anesthesia from 1954, which reported a rate of death from all causes at 1:75 and a rate attributed to anesthesia alone at 1:2680.:993 Direct comparisons between mortality statistics cannot reliably be made over time and across countries because of differences in the stratification of risk factors, however, there is evidence that anesthetics have made a significant improvement in safety but to what degree is uncertain. On 14 December 2016 the Food and Drug Administration issued a Public Safety Communication warning that "repeated or lengthy use of general anesthetic and sedation drugs during surgeries or procedures in children younger than 3 years or in pregnant women during their third trimester may affect the development of children's brains." The warning was criticized by the American College of Obstetricians and Gynecologists, which pointed out the absence of direct evidence regarding use in pregnant women and the possibility that "this warning could inappropriately dissuade providers from providing medically indicated care during pregnancy." Patient advocates noted that a randomized clinical trial would be unethical, that the mechanism of injury is well-established in animals, and that studies had shown exposure to multiple uses of anesthetic significantly increased the risk of developing learning disabilities in young children, with a hazard ratio of 2.12 (95% confidence interval, 1.26–3.54). Discovered in 1831 by an American physician Samuel Guthrie (1782–1848), and independently a few months later by Frenchman Eugène Soubeiran (1797–1859) and Justus von Liebig (1803–73) in Germany, chloroform was named and chemically characterised in 1834 by Jean-Baptiste Dumas (1800–84). In 1842, Dr Robert Mortimer Glover in London discovered the anaesthetic qualities of chloroform on laboratory animals. In 1847, Scottish obstetrician James Young Simpson was the first to demonstrate the anesthetic properties of chloroform on humans and helped to popularise the drug for use in medicine. Its use spread quickly and gained royal approval in 1853 when John Snow gave it to Queen Victoria during the birth of Prince Leopold. During the birth itself, chloroform met all the Queen's expectations; she stated it was "delightful beyond measure". Unfortunately, though free of ether's flammability and consequent explosion hazard, chloroform is not as safe pharmacologically, especially when administered by an untrained practitioner (medical students, nurses, and occasionally members of the public were often pressed into giving anesthetics at this time). This led to many deaths from the use of chloroform that (with hindsight) might have been preventable. The first fatality directly attributed to chloroform anesthesia was recorded on 28 January 1848 after the death of Hannah Greener. Almost all healthcare providers use anesthetic drugs to some degree, but most health professions have their own field of specialists in the field including medicine, nursing and dentistry. Doctors specializing in anaesthesiology, including perioperative care, development of an anesthetic plan, and the administration of anesthetics are known in the US as anesthesiologists and in the UK, Canada, Australia, and NZ as anaesthetists or anaesthesiologists. All anesthetics in the UK, Australia, New Zealand, Hong Kong and Japan are administered by doctors. Nurse anesthetists also administer anesthesia in 109 nations. In the US, 35% of anesthetics are provided by physicians in solo practice, about 55% are provided by anesthesia care teams (ACTs) with anesthesiologists medically directing anesthesiologist assistants or certified registered nurse anesthetists (CRNAs), and about 10% are provided by CRNAs in solo practice. There can also be anesthesiologist assistants (US) or physicians' assistants (anaesthesia) (UK) who assist with anesthesia. ^ a b c d e f g h i j k l m n o p q r s t Miller, Ronald D (2010). Erikson, Lars I; Fleisher, Lee A; Wiener-Kronish, Jeanine P; Young, William L (eds.). Miller's Anesthesia Seventh edition. USA: Churchill Livingstone Elsevier. ISBN 978-0-443-06959-8. ^ a b c Gelb AW, Morriss WW, Johnson W, Merry AF, Abayadeera A, Belîi N, Brull SJ, Chibana A, Evans F, Goddia C, Haylock-Loor C, Khan F, Leal S, Lin N, Merchant R, Newton MW, Rowles JS, Sanusi A, Wilson I, Velazquez Berumen A (June 2018). "World Health Organization-World Federation of Societies of Anaesthesiologists (WHO-WFSA) International Standards for a Safe Practice of Anesthesia". Anesth. Analg. 126 (6): 2047–2055. doi:10.1213/ANE.0000000000002927. PMID 29734240. ^ a b Fitz-Henry, J (April 2011). "The ASA classification and peri-operative risk". Annals of the Royal College of Surgeons of England. 93 (3): 185–187. doi:10.1308/rcsann.2011.93.3.185a. PMC 3348554. PMID 21477427. ^ Goneppanavar, U; Prabhu, M (September – October 2013). "Anaesthesia Machine: Checklist, Hazards, Scavenging". Indian Journal of Anaesthesia. 57 (5): 533–540. doi:10.4103/0019-5049.120151. PMC 3821271. PMID 24249887. ^ Subrahmanyam M, Mohan S (September 2013). "Safety Features in Anaesthesia Machine". Indian Journal of Anaesthesia. 57 (5): 472–480. doi:10.4103/0019-5049.120143. PMC 3821264. PMID 24249880. ^ Reddy S, Patt RB (November 1994). "The benzodiazepines as adjuvant analgesics". Journal of Pain and Symptom Management. 9 (8): 510–4. doi:10.1016/0885-3924(94)90112-0. PMID 7531735. ^ Walker KJ; et al. (October 2009). "Ultrasound guidance for peripheral nerve blockade". Cochrane Database of Systematic Reviews. 2009 (4): CD006459. doi:10.1002/14651858.CD006459.pub2. PMID 19821368. ^ Ullah H; et al. (April 2014). "Continuous interscalene brachial plexus block versus parenteral analgesia for postoperative pain relief after major shoulder surgery". Cochrane Database of Systematic Reviews (2): #. doi:10.1002/14651858.CD007080.pub2. PMID 24492959. ^ Andreae, MH Andreae DA (17 October 2012). "Local anaesthetics and regional anaesthesia for preventing chronic pain after surgery". Cochrane Database of Systematic Reviews. 2012 (10): CD007105. doi:10.1002/14651858.CD007105.pub2. PMC 4004344. PMID 23076930. ^ Klomp T; et al. (September 2012). "Inhaled analgesia for pain management in labour". Cochrane Database of Systematic Reviews. 12 (9): CD009351. doi:10.1002/14651858.CD009351.pub2. hdl:1871/48559. PMID 22972140. ^ Bell, Rae F; Dahl, Jørgen B; Moore, R Andrew; Kalso, Eija A (January 2006). "Perioperative ketamine for acute postoperative pain". Cochrane Database of Systematic Reviews. 25 (1): CD004603. doi:10.1002/14651858.CD004603.pub2. PMID 16437490. ^ McNicol ED, Ferguson MC, Hudcova J (June 2015). "Patient controlled opioid analgesia versus non-patient controlled opioid analgesia for postoperative pain". Cochrane Database Syst Rev (6): CD003348. doi:10.1002/14651858.CD003348.pub3. PMID 26035341. ^ Jones L; et al. (March 2012). "Pain management for women in labour: an overview of systematic reviews". Cochrane Database of Systematic Reviews. 3 (3): CD009234. doi:10.1002/14651858.CD009234.pub2. PMID 22419342. ^ Novikova N; et al. (September 2012). "Local anaesthetic nerve block for pain management in labour". Cochrane Database of Systematic Reviews. 12 (9): CD009351. doi:10.1002/14651858.CD009351.pub2. hdl:1871/48559. PMID 22972140. ^ Guay J, Kopp S (January 2016). "Epidural pain relief versus systemic opioid-based pain relief for abdominal aortic surgery". Cochrane Database Syst Rev (1): CD005059. doi:10.1002/14651858.CD005059.pub4. PMID 26731032. ^ a b Lagasse, RS (December 2002). "Anesthesia Safety: Model or Myth?". Anesthesiology. 97 (6): 1609–17. doi:10.1097/00000542-200212000-00038. PMID 12459692. ^ Chaloner EJ, Ham RJ (August 2001). 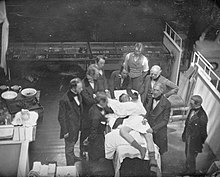 "Amputations at the London Hospital 1852–1857". Journal of the Royal Society of Medicine. 94 (8): 409–412. doi:10.1177/014107680109400812. PMC 1281639. PMID 11461989. ^ Braz LG (October 2009). "Mortality in Anesthesia: A Systematic Review". Clinics. 64 (10): 999–1006. doi:10.1590/S1807-59322009001000011. PMC 2763076. PMID 19841708. ^ American College of Obstetricians and Gynecologists "Practice Advisory: FDA Warnings Regarding Use of General Anesthetics and Sedation Drugs in Young Children and Pregnant Women", ACOG Website, 21 December 2016. Retrieved on 3 January 2017. ^ Kennerly Loutey "Anesthesia in Pregnant Women And Young Children: The FDA Versus ACOG", Website, Retrieved on 3 January 2017. ^ Whitaker DK, Booth H (March 2013). "Immediate post-anaesthesia recovery 2013: Association of Anaesthetists of Great Britain and Ireland". Anaesthesia. 68 (3): 288–97. doi:10.1111/anae.12146. PMID 23384257. ^ Rudolph JL; et al. (September 2008). "Delirium is associated with early postoperative cognitive dysfunction". Anaesthesia. 63 (9): 941–947. doi:10.1111/j.1365-2044.2008.05523.x. PMC 2562627. PMID 18547292. ^ Deiner S, Silverstein JH (2009). "Postoperative delirium and cognitive dysfunction". British Journal of Anaesthesia. 103 (Suppl 1): i41–i46. doi:10.1093/bja/aep291. PMC 2791855. PMID 20007989. ^ Powell MA (1996). "Chapter 9: Wine and the vine in ancient Mesopotamia: the cuneiform evidence". In McGovern PE, Fleming SJ, Katz SH (eds.). The origins and ancient history of wine (Food and nutrition in history and anthropology). 11 (1 ed.). Amsterdam: Gordon and Breach Publishers. pp. 96–124. ISBN 978-90-5699-552-2. ^ Booth M (1996). "The discovery of dreams". Opium: A History. London: Simon & Schuster, Ltd. p. 15. ISBN 978-0-312-20667-3. ^ Ludwig Christian Stern (1889). Ebers G (ed.). Papyrus Ebers (in German). 2 (1 ed.). Leipzig: Bei S. Hirzel. OCLC 14785083. Retrieved 18 September 2010. ^ Pahor, AL (1992). "Ear, nose and throat in ancient Egypt: Part I". The Journal of Laryngology & Otology. 106 (8): 677–87. doi:10.1017/S0022215100120560. PMID 1402355. Retrieved 16 September 2010. ^ Sullivan, R (1996). "The identity and work of the ancient Egyptian surgeon". Journal of the Royal Society of Medicine. 89 (8): 467–73. doi:10.1177/014107689608900813. PMC 1295891. PMID 8795503. ^ Ruetsch, YA; Böni, T; Borgeat, A (2001). "From Cocaine to Ropivacaine: The History of Local Anesthetic Drugs". Current Topics in Medicinal Chemistry. 1 (3): 175–82. doi:10.2174/1568026013395335. PMID 11895133. ^ Koller, K (1884). "Über die verwendung des kokains zur anästhesierung am auge" [On the use of cocaine for anesthesia on the eye]. 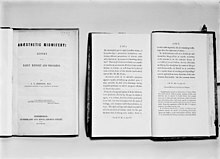 Wiener Medizinische Wochenschrift (in German). 34: 1276–1309. ^ Bier, A (1899). "Versuche über cocainisirung des rückenmarkes" [Experiments on the cocainization of the spinal cord]. Deutsche Zeitschrift für Chirurgie (in German). 51 (3–4): 361–9. doi:10.1007/BF02792160. ^ Brill, S; Gurman, GM; Fisher, A (2003). "A history of neuraxial administration of local analgesics and opioids". European Journal of Anaesthesiology. 20 (9): 682–9. doi:10.1017/S026502150300111X. PMID 12974588. ^ a b Toski, Judith A; Bacon, Douglas R; Calverley, Rod K (2001). The history of Anesthesiology. In: Barash, Paul G; Cullen, Bruce F; Stoelting, Robert K. Clinical Anesthesia (4 ed.). Lippincott Williams & Wilkins. p. 3. ISBN 978-0-7817-2268-1. ^ Hademenos GJ, Murphree S, Zahler K, Warner JM (12 November 2008). McGraw-Hill's PCAT. McGraw-Hill. p. 39. ISBN 978-0-07-160045-3. ^ a b Fenster, JM (2001). "Power Struggle". Ether Day: The Strange Tale of America's Greatest Medical Discovery and the Haunted Men Who Made It. New York: HarperCollins. pp. 106–16. ISBN 978-0-06-019523-6. ^ a b Hardman, Jonathan G. (2017). Oxford Textbook of Anaesthesia. Oxford University Press. p. 529. ^ Long, CW (1849). "An account of the first use of Sulphuric Ether by Inhalation as an Anesthetic in Surgical Operations". Southern Medical and Surgical Journal. 5: 705–713. ^ "Miniature Portrait of Horace Wells". National Museum of American History, Smithsonian Institution. Retrieved 30 June 2008. ^ Morkel, H (16 October 2013). "The painful story behind modern anesthesia". pbs.org. ^ Baillie, Thomas W. (1965). "The first European trial of anaesthetic ether: The Dumfries claim". British Journal of Anaesthesia. 37 (12): 952–957. doi:10.1093/bja/37.12.952. ^ Defalque, R. J.; Wright, A. J. (2004). "The short, tragic life of Robert M. Glover" (PDF). Anaesthesia. 59 (4): 394–400. doi:10.1111/j.1365-2044.2004.03671.x. PMID 15023112. ^ "Sir James Young Simpson". Encyclopædia Britannica. Retrieved 23 August 2013. ^ "Queen Victoria uses chloroform in childbirth, 1853". Financial Times. 28 November 2017. ^ Wawersik, J. (1 January 1997). "History of chloroform anesthesia". Anaesthesiologie und Reanimation. 22 (6): 144–152. PMID 9487785. ^ Zorab, John (June 1992). "On Narcotism by the Inhalation of Vapours by John Snow MD". Journal of the Royal Society of Medicine. 85 (6): 371. ^ "Anesthesia LAND". patinaa.blogfa.com. Retrieved 2 December 2016. ^ a b Cope, Doris K. (1993). "James Tayloe Gwathmey: Seeds of a Developing Specialty". Anesthesia & Analgesia. 76 (3): 642–647. doi:10.1213/00000539-199303000-00035. ^ a b McAuliffe, MS; Henry, B (2010). "Nurse anesthesia worldwide: practice, education and regulation" (PDF). Downloads. Silver Spring, Maryland: International Federation of Nurse Anesthetists. Retrieved 13 June 2012. ^ Abenstein, JP; Long, KH; McGlinch, BP; Dietz, NM (2007). "Is Physician Anesthesia Cost-Effective?". Anesthesia & Analgesia. 98 (3): 750–7. doi:10.1213/01.ANE.0000100945.56081.AC. PMID 14980932. ^ Rosenbach, ML; Cromwell, J (2007). "When do anesthesiologists delegate?". Medical Care. 27 (5): 453–65. doi:10.1097/00005650-198905000-00002. PMID 2725080. ^ "Five facts about AAs". American Academy of Anesthesiologist Assistants. Archived from the original on 26 September 2006. Retrieved 25 November 2010.